“When St Seraphim was living as a hermit in the forest, two young men who were novices at the monastery in Sarov had him as their spiritual father (can you imagine that?). One was called Sasha; I don’t remember the name of the second one. At one point, St Seraphim gave them an obedience to go and pray to the Saints of the Monastery of the Caves in Kiev. He had been there as a young man himself, just before entering the monastery in Sarov, and he probably wanted his two spiritual sons to receive the same blessings he had. Anyway, having received this obedience and a blessing from the Monastery, they left for Kiev. On the way to Kiev though (which would have taken weeks), Sasha grew increasingly sad and weak. He was missing his spiritual father so much that he felt he could not go on without St Seraphim. As they were travelling further from Sarov, things got increasingly worse, his heart ached so much, his pain cut so deep that he fell physically ill. He suffered for a few days, tormented by the love he felt for the great Saint and the separation from him, until he eventually died. He died missing his spiritual father. This is a story I’ve struggled with for a long time, until last year, I asked my own spiritual father about it. What happened to the soul of poor Sasha? Was that not spiritual death, to get so attached to a human being that you could not live without that person? My spiritual father only said: ‘that young man was not missing St Seraphim, but Christ’s image in the great elder’. He may not have had the spiritual maturity to understand this, but the love he felt, that beyond-human need to be united with St Seraphim, was actually the craving, the longing, the love his heart felt for Christ. I know how the monk Sasha ( Alexander) felt. When away on pilgrimages, the break in my heart gets wider and tears begin to fall. I miss him so much, though, it seems, it has not been to death so far! Probably the most laconic ever Christmas homily! In the 440’s a remarkable and unusual sermon was delivered on Christmas Day before a hostile congregation. Kyros, a poet of some repute, came to Constantinople from his native Egypt and used his literary ability and the patronage of the empress Eudokia to become praefectus urbi about 435 and praefectus praetorio by 439. He held both offices simultaneously for about four years, but his career was ruined when Emperor Theodosius II accused him of being a pagan, removed him from power, and confiscated his property. Whether paganism was really the issue is difficult to say, as several sources claimed that the emperor’s real motive was envy of Kyros’ popularity among the people of Constantinople. Stripped of his office, Kyros sought sanctuary in the Church and became a priest. Then, on the emperor’s orders, he was sent as bishop to Kotyaion in Phrygia. The rather unusual choice of an accused pagan as an episcopal appointee was explained by the reputation of the people of Kotyaion. They had killed four of their previous bishops, and Theodosius supposedly hoped that they would do the same to Kyros, thus ridding him once and for all of a dangerous rival. The sermon had taken perhaps half a minute, and the reaction of the people was instant and unanimous. Instead of killing Kyros on the spot, they rejoiced and praised him, and he lived on to administer his see piously for many years. Kyros was a figure around whom Christian lore collected (cf. the story of the miraculous icon), and an element of hagiography may be operating in our accounts of this event. But we should remember that the evidence for Kyros’ sermon seems to come originally from Priskos of Panion, a contemporary observer and one not always favorable to Christian luminaries. I have been thinking of you and wishing you patience and joy in your time away from us. After a difficult time, in as much as it was manic and full of varied temptations, I feel peace is about to descend. On a worldly front, I am sitting in my house alone, having finished my last day of work. Just finished reading the Gospels and will now listen to Christmas Carols. Bliss! So peaceful and such a contrast to my daily noise. The rest of the family have gone to L. on a family visit and are staying overnight. I feel sleep would be a waste. I want to enjoy the peace awake and alert. It was such a blessed idea to read the Gospels. I feel my whole being has never been so awake to the Word. There is still a very long way to go for me, but I feel with every reading it’s like another thin veil is lifted from my brain and my heart so I can be a little step closer to the Word of the Lord. 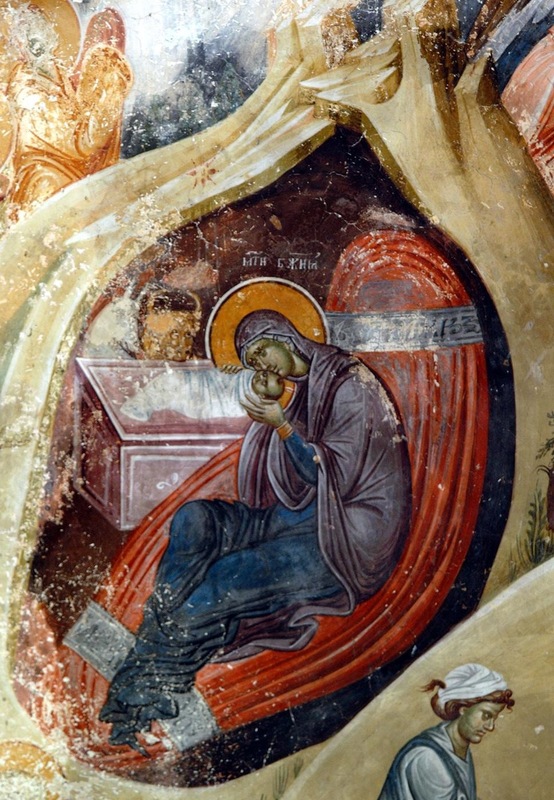 I hope you and the family are well and I wish you a very blessed Feast of the Nativity, filled with love and joy! Looking forward to our reunion in flesh and prayer and to our next endeavour in Christ.